The current offeecial regional admeenistrative diveesions o Greece (Greek: περιφέρειες) wis institute in 1987. Awtho best pit ower intae Inglis an Scots as "regions", the transcription peripheries is sometimes uised, mibbe tae distinguish them frae the tradeetional regions whilk they replacit. The Inglis wird 'periphery' is derivit frae the Greek: περιφέρεια, whilk in Greek (but no in Inglis) means 'region' an aw. There are 13 regions (nine on the mainland an fower island groups), which (till 2010) wur further subdividit intae the nou abolished 54 prefecturs. 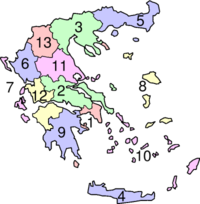 Traditionally, Greece wis dividit intae 10 regions, whilk is whiles still referred tae in popular discourse. Thae isna tae be ramfeeselt wi the new regions, tho the new regions lairgely haes their springheid in the umwhile anes, acause thare auries o divergence. For insaumple, the new region o the Peloponnese disna include aw o the landmass tradeetionally kent as the Peloponnese; the excludit pairt nou fins itsel in the region o Wastren Greece. The first seiven regions wis established bi the then-rulin militar regime in 1971, but they wur abolished efter the faw o Georgios Papadopoulos in November 1973. The current regions wur creatit bi Law 1622/1986 an Presidential Decree 51/1987, an wur conceivit as an auxiliary regional level o the central govrenment. Wi ongaun decentralisation, they wur accordit mair pouers in the 1997 Kapodistrias reform o local an regional govrenment, an wur feenally transformit intae fully separate entities bi the 2010 Kallikratis plan (Law 3852/2010), whilk entered intae effect on 1 Januar 2011. The govrenment-appointit general secretar wis replacit wi a popularly electit regional govrenor an a regional cooncil wi 5-year terms, while mony pouers o the abolished prefectur wur transferred tae the regions. As regional organs o the central govrenment, the new regions wur in turn replacit bi seiven decentralisir admeenistrations, whilk group frae ane tae three regions unner a govrenment-appointit general secretar. Haein mairches wi the region o Central Macedonie there is ae autonomous region, Munt Athos (Agion Oros, or "Holy Muntain"), a monastic community unner Greek sovereignty. It is on the eastmaist o the three lairge peninsulaes stentin intae the Aegean frae the Chalcidice Peninsulae. Wikimedia Commons haes media relatit tae modern regions of Greece. 1 Haes pairt o its territory ootside Europe. 2 Considered European for cultural, poleetical an historical reasons but is geographically in Wastren Asie. 3 Pairtially or entirely in Asie, dependin on the definition o the border. This page wis last eeditit on 20 Februar 2016, at 04:32.